What Can The Church Still Learn From Dr King Today? Today, Monday January 21st, we mark Martin Luther King Day in the USA. In this post we pay tribute to the great man, as we remember his significant contribution to racial reconciliation. 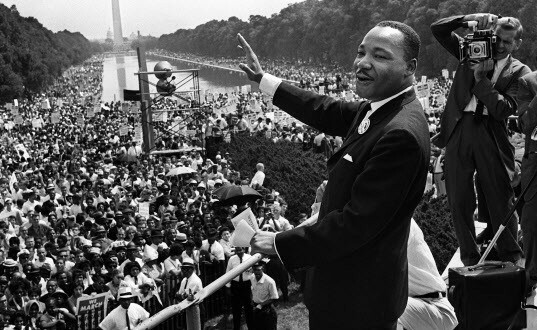 American Writer, Jared Laskey also examines what the Church can still learn from Dr King today. America needs the spirit of Martin Luther King, Jr. It needs strong Christian leaders speaking the truth in love. Leaders who are prophetic voices, crying out against sin and injustice, calling people to the feet of Jesus through acts of mercy and non-violence. Dr. King was not only a man of prayer but also action. Through his dedicated preaching, teaching, writing and marching, he led a movement that helped change the unjust laws of segregation in the USA. Hearts and minds were transformed through his scripturally based philosophy and leadership. The Church should not hibernate within its four walls. Instead, it should be mobilizing and take-action while praying. Acts of mercy and compassion should be constant, flowing out into the streets through power evangelism. This needs to be a lifestyle of love, not just an annual branded and marketed one-week campaign of kindness. The Church’s social action must not compromise sharing the Gospel, being saturated in prayer. I remember being part of an evangelistic small group when, in the year 2000, over 400 anarchists came to Eugene, OR. They wanted to have illegal concerts under the bridges and in the parks of the city for several days. This festival was leading up to a “re-enactment” of the previous year’s Father’s Day riot. The county was on edge. And we had 24-hours of prayer in the basement of a church where we also prepared food and other necessities for the outreach. Food, water and blankets were given to the anarchists and to the police. Some of the anarchists told us that we were the first Christians to ever reach out to them. Hearing this I was grieved, knowing that it is tragic when the Church does not reach certain segments of people due to differences. The anarchists tried to look and act intimidating. But through conversation we saw they are flawed people looking for answers in a messed-up world, needing God’s love just like everyone else. On the day of the “re-enactment,” I was carrying water jugs just in case the riot police would use tear-gas. Both the cops and the anarchists knew who we were and what we were doing. We were revealing Christ’s love to everyone during those troubled times. I prayed in the Spirit out-loud while the police worked hard at keeping the peace for the community. But I saw hatred at work as well. I learned early on in life that hate blinds us to the truth. If we hate fellow Christians, then we walk in darkness and are spiritually blind (1 John 2:11). Hatred is to be put to death when we are in Christ (Colossians 3:5-11). Hate and ‘anti-hate’ groups are haters when both use the same tactics, instigating violence and intimidation to stop the other’s agenda. They are consumed with their ideology, being blind to the repercussions of their hatred and lawlessness. Innocent people and family are caught in-between. Followers of Jesus are called to be loving. In John 13:34-35 Jesus said, “A new commandment I give to you, that you love one another, even as I have loved you, that you also love one another. By this all men will know that you are My disciples, if you have love for one another.” Our actions need to line up with Jesus’ life. Living in a prejudiced culture, Jesus broke racial and social barriers. In talking with the Samaritan woman at the well in John 4, Jesus brought salvation to a group of people considered “inferior” by the Jews. He modeled racial reconciliation and forgiveness in a hostile political environment, and He expected His followers to do the same. Matthew 28:19, Jesus said, “Go therefore and make disciples of all nations, baptizing them in the Name of the Father and of the Son and of the Holy Spirit.” The Koine Greek word for “nations” is ethne, defined as “nations” and “people,” (William D. Mounce’s Analytical Lexicon to the Greek New Testament, page163). Political boundaries are not the implication, but ethnic groups are. Jesus was stating that the Gospel is for all races, people and cultures. God’s love is for everyone. The message of love needs to be applied around the world. God is love (1 John 4:8). He loved us so much that He sent His Son who died on the cross for our sins and rose from the dead (John 3:16-17; 1 Corinthians 15:3-6). The only hope the world is needing is found in Jesus. While the world is rioting, looting and screaming at one another, we need to be the rational voice of reason and dialogue, holding firmly to the word of life (Philippians 2:16).